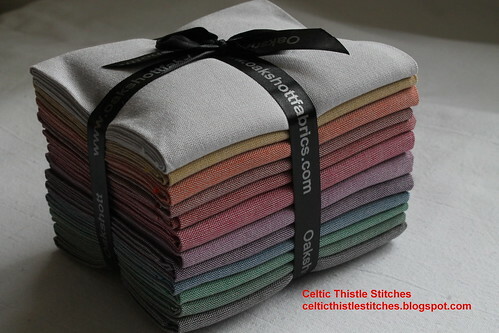 Celtic Thistle Stitches: A bundle of Oakshott loveliness. If you haven't entered the competition yet, then here is an incentive for you! I would love to hold on to this but sadly, for me anyway, it will be winging its way to one lucky entrant later this month. So, if you want that person to be you you know what you have to do! The entries are looking amazing and definitely deserving of a bundle of Oakshott!!! Wow! I'm sewing as fast as I can! I've never used Oakshotts but they look gorgeous. Kicking myself for making a bag/pouch which is just too small to enter into your competition.